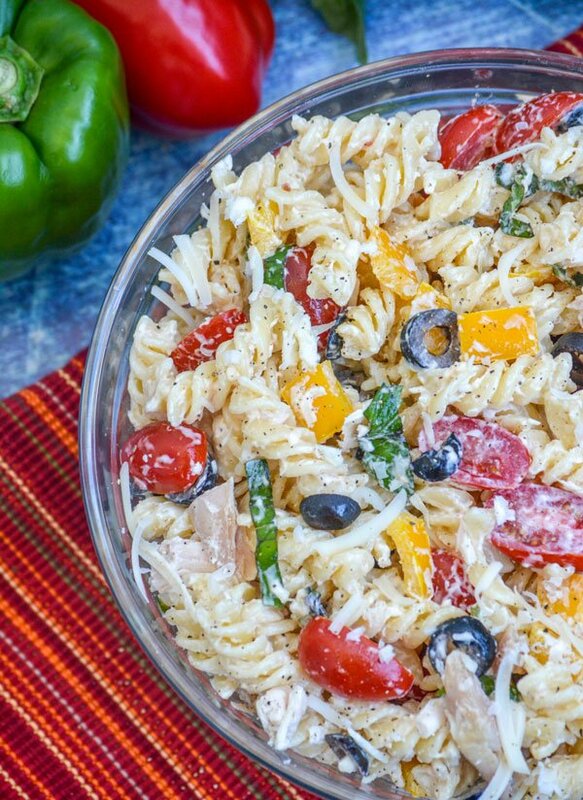 This Creamy Italian Chicken & Asiago Pasta Salad makes a perfect Summer meal all in one bowl. Whether served for lunch or dinner, it’s full of meat, pasta, and plenty of yummy fresh veggies tossed in a creamy Italian dressing. Summer’s are surprisingly tough for me in the planning/scheduling department. The kids are out of school. The Hub’s work routine goes into a natural state of flux. There’s no clear plan, no clear function to our day to day. While there are times that I relish that fact, it also means that it’s harder for me to keep up with and keep on track. I’m one of those weird people. If it doesn’t get scheduled in my family planner, or on the family memo board, it doesn’t exist. Really, it just doesn’t happen. Even if I remembered if the night before, I will still forget it, and it still won’t happen. Much to my, and everyone else in the household’s, frustration. The same goes for meal times, especially lunch and supper. Sandwiches are great and all, but I can’t except the kids to eat them every single day, all Summer long. Even I wouldn’t want to do that. Same with dinner, hamburgers and hot dogs are easy to throw on the grill at any given moment, but there can still be too much of anything. Of course, I have a handful of fly by the seat of my pants meals for supper, but even those would get old real if constantly eaten. 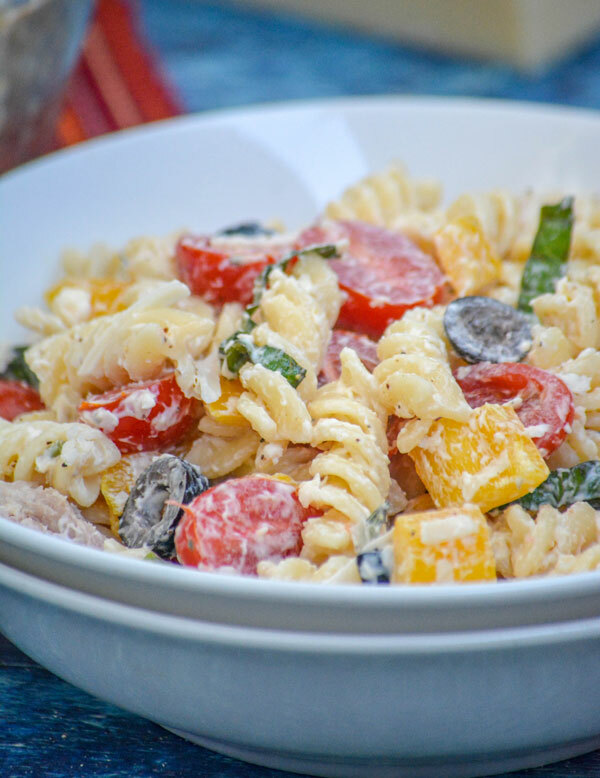 This is why I adore an easy, but hearty pasta salad. They make a solid meal, for lunch or for dinner, and are never lacking in flavor. Also, I can make them ahead of time, like on the weekends, or the night before when I happen to be thinking about it. All of my family’s deepest thanks, go to the humble pasta salad. Even when it’s similar, it breaks up the meal time monotony. It’s like you’re never eating the same meal twice. 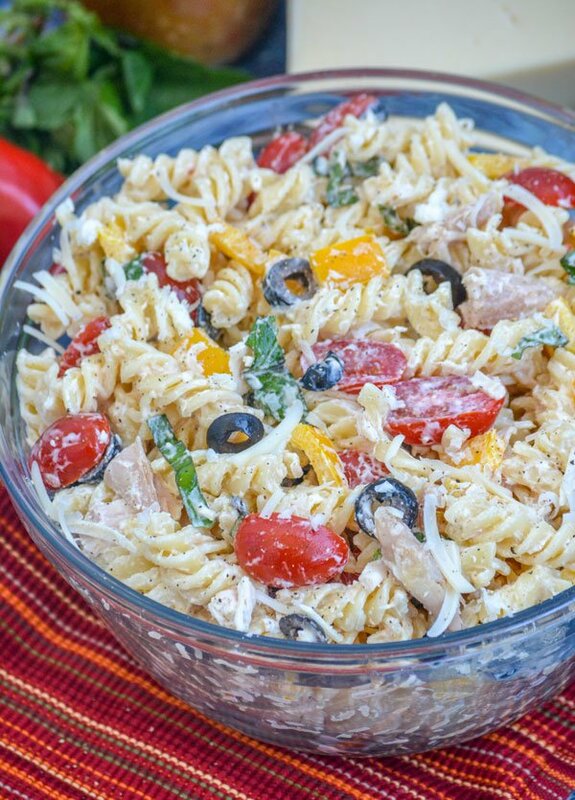 This Creamy Italian Chicken & Asiago Pasta Salad is one of their more particular favorites. It gets requested quite often. This is almost an entire meal in one single dish. 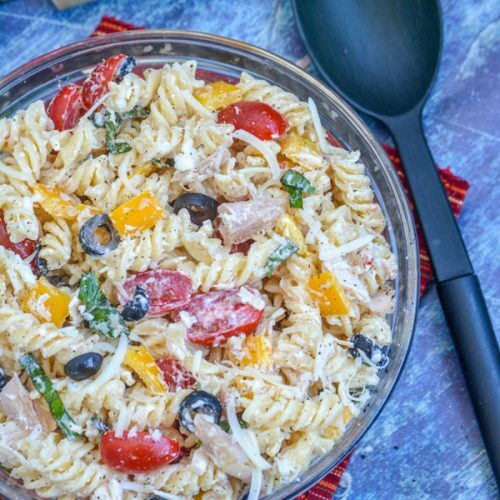 It features rotini pasta, fresh grape tomatoes, sweet peppers, thinly sliced basil, black olives, and chunks of chopped rotisserie chicken. It gets a special kick from fresh lemon juice, black pepper, and tangy shaves Asiago cheese. Tossed in a creamy Italian dressing, this is the Italian-style chicken salad you didn’t know you’d been missing, and one the whole family will love. 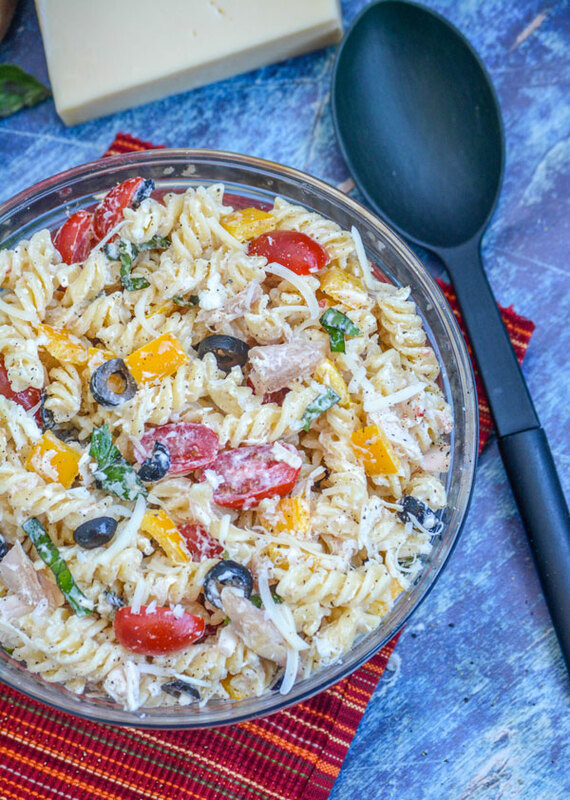 When Summer meals get tough, don’t stress- with just a few simple ingredients, this Creamy Italian Chicken & Asiago Pasta Salad has got you covered. 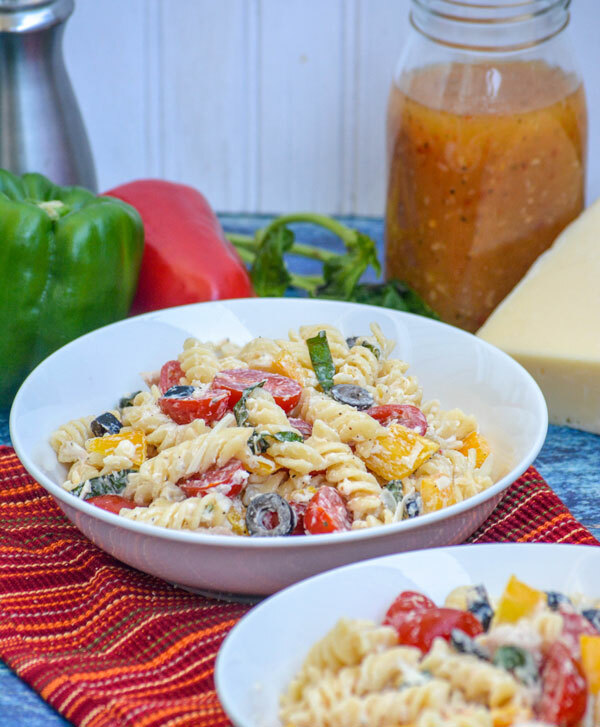 Other pasta salad’s you might also enjoy: Summertime Tortellini & Vegetable Pasta Salad, Pizza Pasta Salad, Chicken Club Pasta Salad, & Mediterranean Tortellini Pasta Salad. 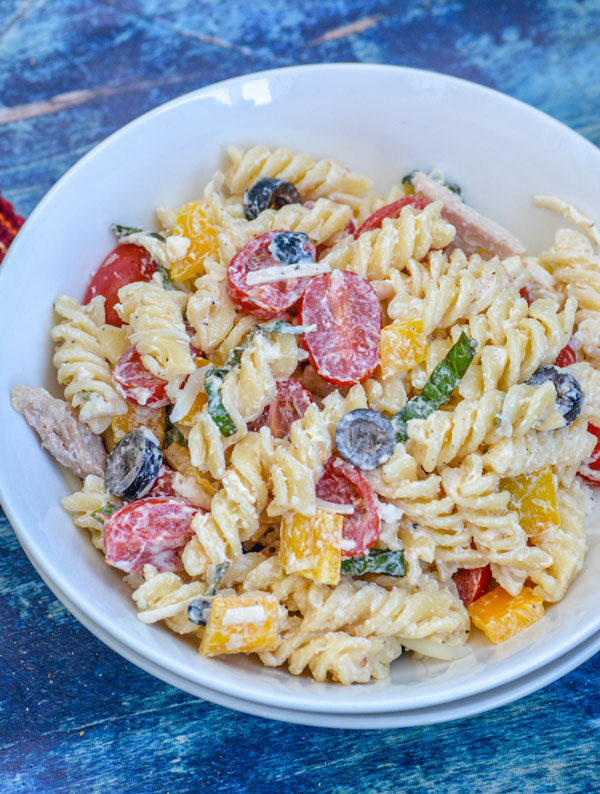 A creamy, Italian-style pasta salad this one has delicious chunks of rotisserie chicken and tangy shaved Asiago cheese. In a medium sized mixing bowl, add the mayonnaise, dressing, lemon juice, and black pepper. Whisk together until completely combined. If the dressing appears to thick, add another tablespoon or so of dressing to the mixture. To a large mixing bowl, add the cooled pasta, tomatoes, peppers, chicken, olives, cheese, and basil. Gently toss the ingredients to evenly combined. Stir in the dressing mixture, tossing evenly until everything's combined and creamy. If the mixture's still not creamy enough for you, add a little extra Italian dressing, stirring to evenly combine. Taste and salt & pepper, to taste. Seal the mixture, either with plastic wrap or in a tupper ware, and refrigerate until chilled, and/or ready to serve.